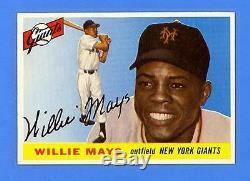 WILLIE MAYS 1955 TOPPS #194 - HI # - NEW YORK GIANTS - MINT CONDITION!! Battlefield Vintage is dedicated to bringing you high quality vintage sports memorabilia auctions each month. Please check back often as we are constantly acquiring new items. All items are 100% authentic & unaltered unless otherwise specified in the description. This card is part of the rare Hi # series! This card is in wonderful condition! It is 100% authentic & unaltered! This card has no creases, 4 very strong corners, perfect centering, beautiful color, awesome eye appeal, and a beautiful clean back. There are no pinholes, markings, paper loss, or any damage of that kind. 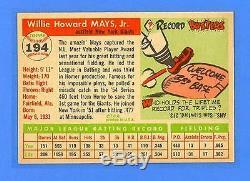 This is far & away the most amazing raw ungraded 55 Topps Mays card I have ever seen! It is an incredible card! This card would be a great addition to any vintage collection. If you have any questions I will be happy to answer them. Get Images that Make Supersized Seem Small. Auctiva's Listing Templates improve your auctions in minutes. Attention Sellers - Get Templates Image Hosting, Scheduling at Auctiva. The item "WILLIE MAYS 1955 TOPPS #194 HI # NEW YORK GIANTS MINT CONDITION" is in sale since Saturday, June 04, 2016. This item is in the category "Sports Mem, Cards & Fan Shop\Cards\Baseball". The seller is "battlefield0516" and is located in AL.